With a birthday you have presents, and again I made them all myself. I really hope I will get such a big smile tomorrow!! Let's start with the most awesome piece. 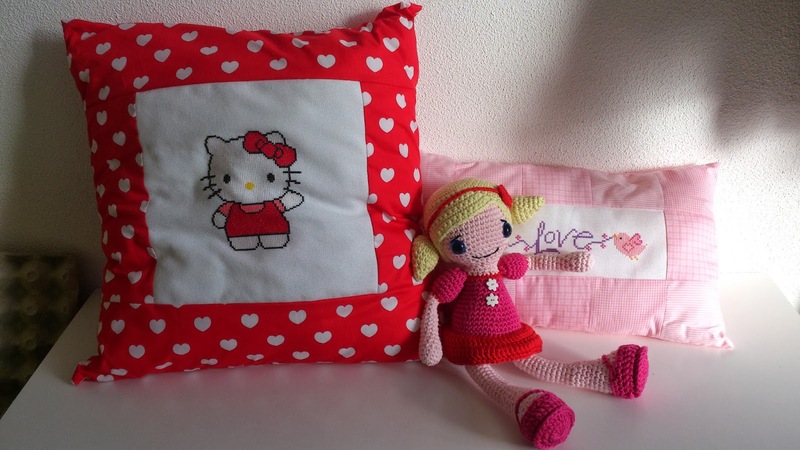 Then I made a while back a Hello Kitty stitching piece. The pillow is 50x50 so also a big piece!! 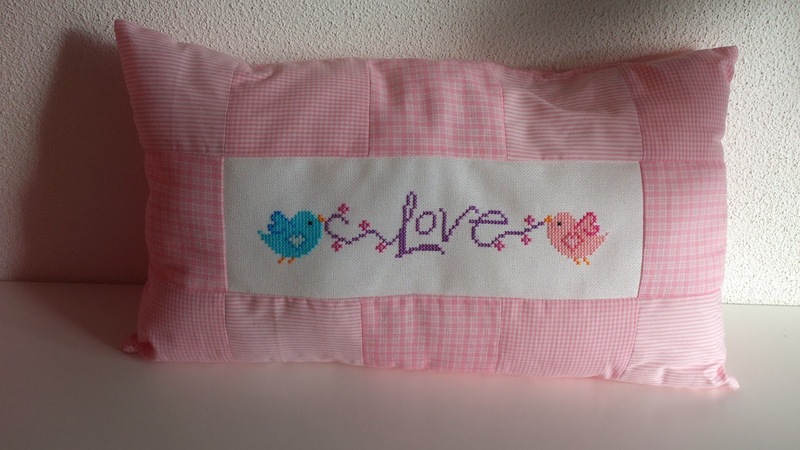 From the moment I stitched it I know I needed to make a pink pillow out of it. And lucky as I was, my sweet friend Nia send me 3 pieces of light pink fabric. I had this plan in my mind for over 2 years now, and finally it's done.. 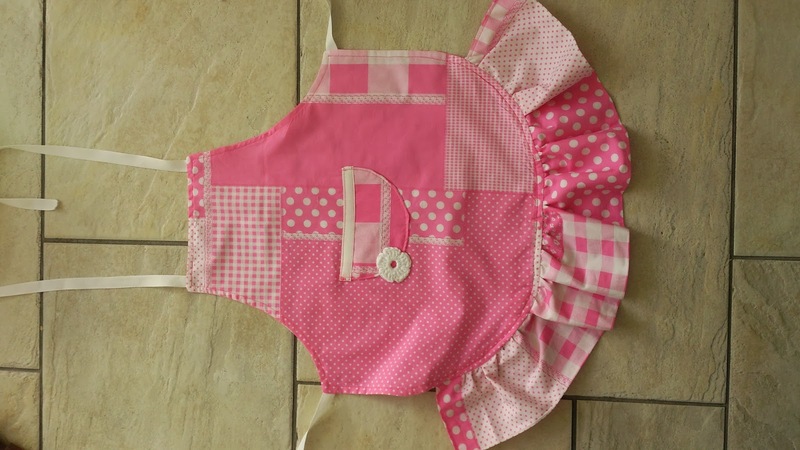 Thank you Vinniey for the cute design and Nia for the wonderfull fabrics ( next post another finish with the fabrics). As last for this post gifts I had to plan making a total set that Kira could wear when playing in her kitchen. I had it all in my mind. I love it.. but after it was finish, not totally as I hoped..
And since Kira likes to decide herself how things look like, she can choose the rest. There will be more kitchen crafts this year!! Then I really have to show you so such a cute sweet gift. Yesterday the mailwomen we only have woman here in town who bring the mail so 2014 hihi =))) brought a pacakage from France for Kira..
That can only be from two people.. and yes..
Sweet Valérie and her SuperHubby send little Kira a birthday gift. She loved it so much.. This morning she needed to go too school. 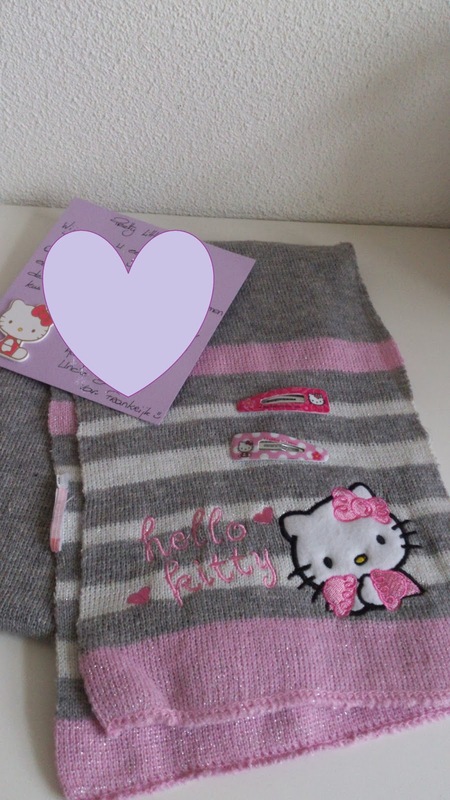 Mommy where is my new scarf I love it so much.. Thank you so much sweeties!! 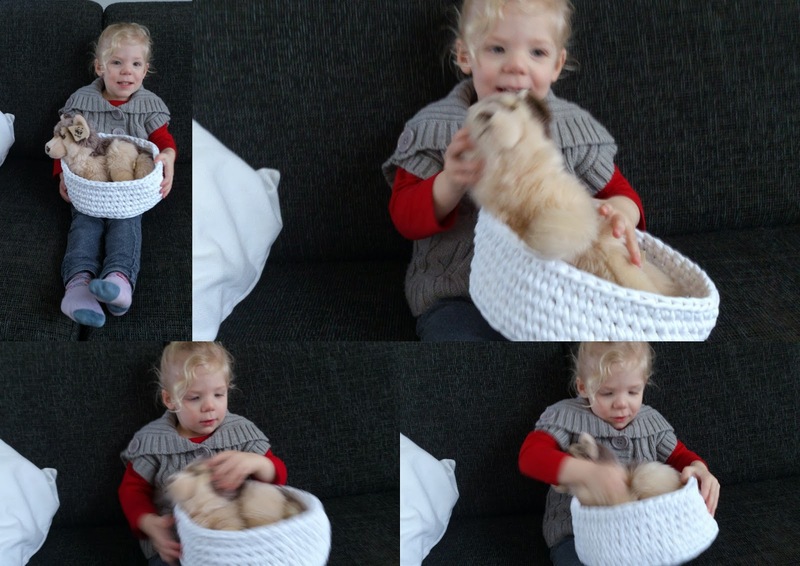 Do you wanne know the name of the little dog?? She is so happy with it!! Big hugs to Kira on her birthday! She's looking so grown-up these days. And what a wonderful assortment of birthday gifts. 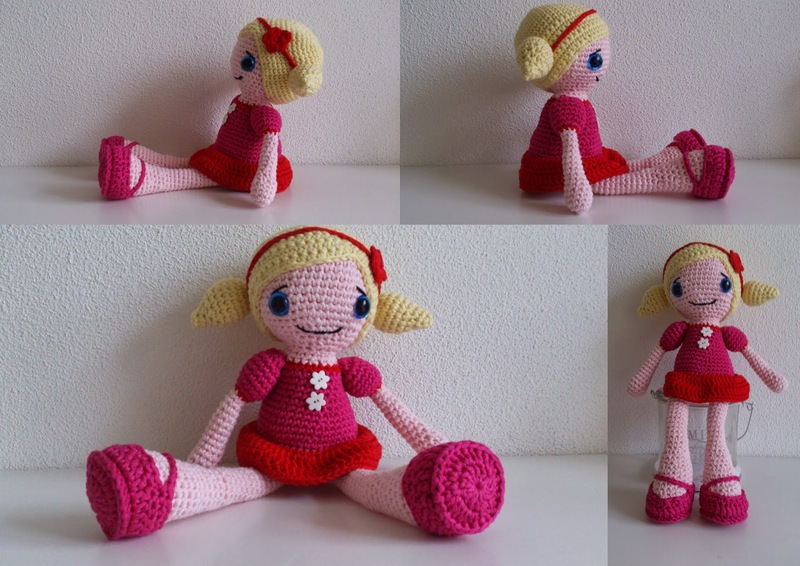 Love that crocheted Kira doll! Zo leuk allemaal! Ik ben erg benieuwd wat ze er van vind.. ze is er vast super blij mee! 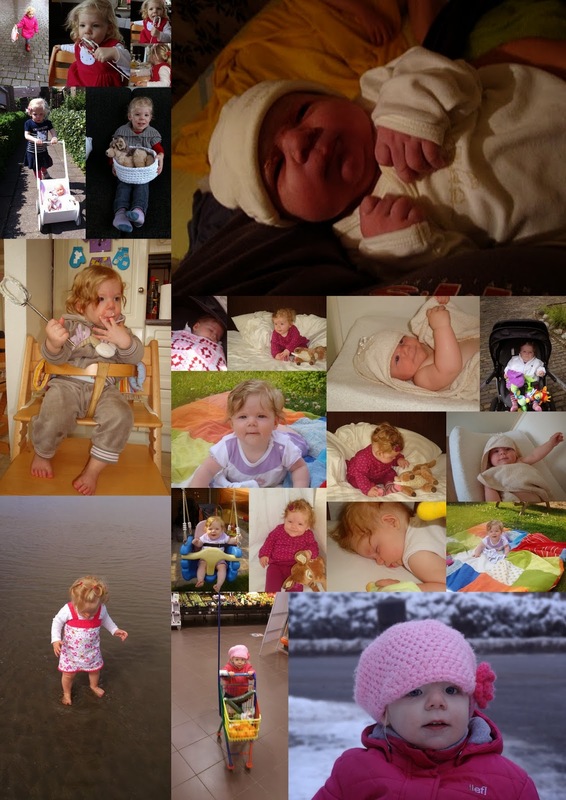 Happy B-day to Kira, you made adorable presents. De pop en kussen zijn erg mooi! Gefeliciteerd! Gefeliciteerd met de verjaardag van Kira. super al die zelfgemaakte kadootjes. fijne dag! I wish her a really nice day!! De pop is een plaatje. Vind het kussen met de vogeltjes ook superlief, ik ga het patroontje eens opslaan...wie weet komt ie nog een keer van pas! 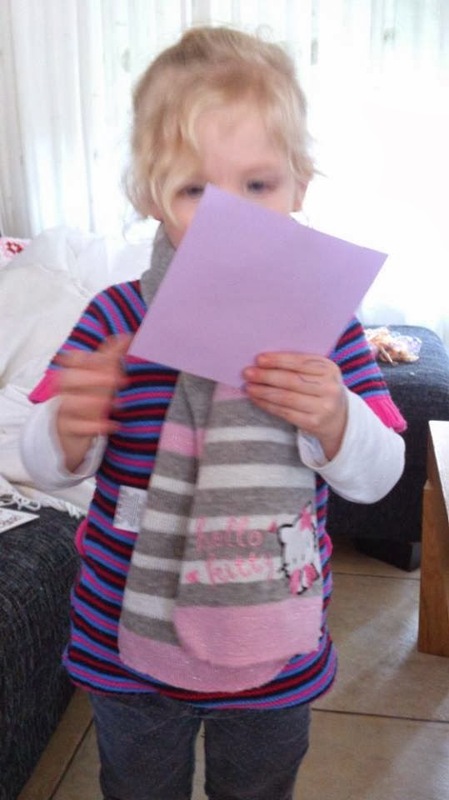 Nog maar 3 jaar..geniet ervan...mijn kleintje wordt 5 maart alweer 7! What a darling little girl Kira is, Annette--I've so enjoyed watching her grow up over the past three years! And I've also enjoyed watching all the pretty pink creations you've made for her--the pillows are darling and her bed for Sausage is so sweet (love his name!!). 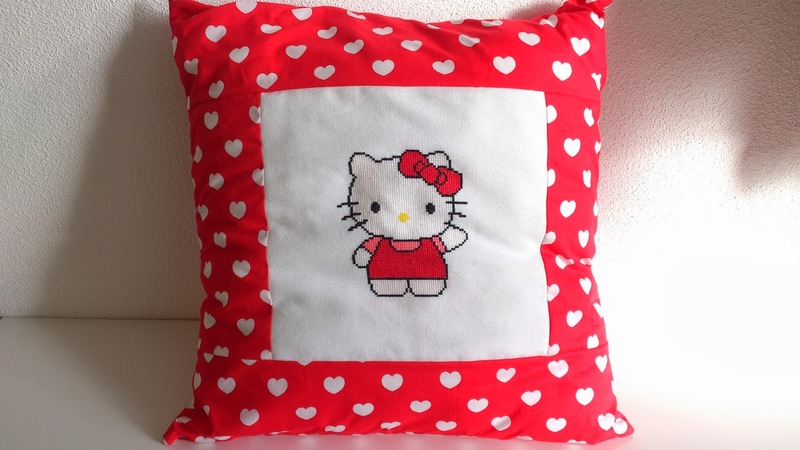 Your pillows are really great, perfect fabrics & sewing ! and this doll...so pretty ! very well done for your little angel. Oh..i missed Kira's birthday...i'm so sorry again:( i won't next year!! Sweet Valerie sent such a pretty gift...i bet Kira really loved it.